There have been two momentous occasions this week for the Walthamstowfoodies. This is our 100th post; and we’ve survived the first of our Appetite 2013 food festival Supperclubs, so we thought we’d update on how we got on. The day started well with a shout-out on Heart breakfast radio. This brought back happy memories of being a kid and my doting Gran getting my name read out on the local radio and them playing the birdie song on my birthday! By the time we made it back home it was 2pm. We hit panic mode – shouting, tears and fits of giggles followed, with one foodie only managing to make it into a pre-dinner shower 20 minutes before kick off! In the end it all went well, if not quite to schedule, there was plenty of food, fun and laughter. 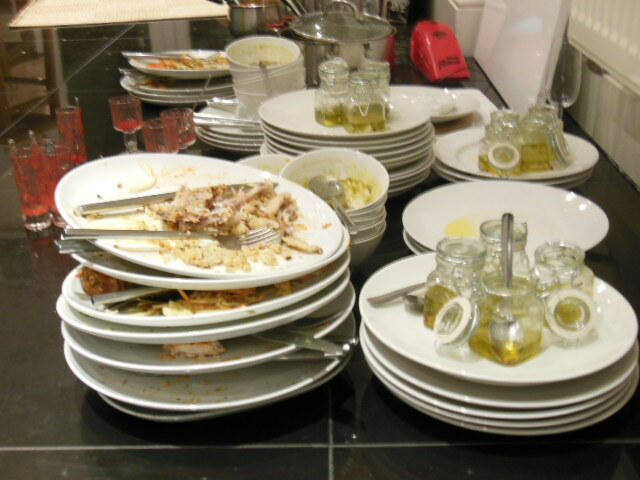 There was a debrief late on Saturday night and it took the whole of Sunday to clear the washing up and reclaim the kitchen. But we had a great evening – here’s to the next 3 weeks! We will be sharing our recipes as promised on Saturday night at the end of June so they will be on the blog shortly along with foodie pics – but in the meantime we want to keep the element of surprise for those guests yet to come for dinner. Special mention to our Saturday night guests – thanks for all your laughter and especially for all the empty plates – we hope to see you again. We have now started our waiting list for July so drop us a line if you’d like to book. This entry was posted in Restaurants in E17, Supperclub and tagged 100th post, Appetite Food Festival, e17, Food Festival, Home, Supperclub, Walthamstow, Walthamstow supperclub, walthamstowfoodies. Bookmark the permalink.